Similar to the early signature and friendship quilts, contemporary memory quilts preserve treasured memories of people, events, accomplishments, and places. Quilters of previous generations saved scraps of fabrics from dresses, aprons, or shirts out of necessity to use in their quilts, creating the unintended, yet still special, tradition of quilts holding special memories and connections to people in our families. 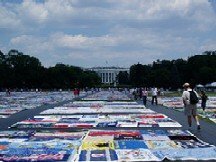 Perhaps the most well-known of all memory quilts, the AIDS Memorial Quilt combines characteristics of traditional as well as modern quilting making. It memorializes individual loved ones as well as building awareness. No longer a necessity for warmth, modern quilts have many other purposes, from wall decorations to table runners to tangible artifacts of memories. Like their ancestors, today's quilters use materials at hand and cultural artifacts for their creations. In addition to traditional fabrics, they may use t-shirts, neck-ties, and photographs transferred to fabric to create quilts that are relevant to modern owners. T-shirts are popular cultural icons, connecting us to teams, events, places, and people. Who doesn't have at least a few t-shirts from special events, places, or teams? Many parents have had the dilemma of the dozens of t-shirts that provide a snapshot of their child's activities and accomplishments. Practicality dictates that there's simply not enough space to save them all, but sentimentality and pride wishes there were an alternative. What's a parent to do with all those t-shirts of your child's athletic events? Or band or choir accomplishments? Or charity events? Or concerts? Quilters to the rescue! 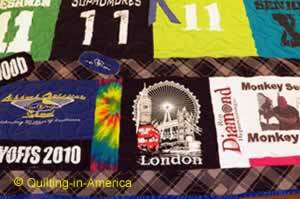 T-shirt quilts have become a popular way to preserve the memories associated with the t-shirts long after the usefulness of the shirts have passed. Whether the quilt is made of only t-shirts or combined with other artifacts, such as patches, logos, or pins, and coordinating fabrics, the resulting quilt is greater than the sum of its parts. 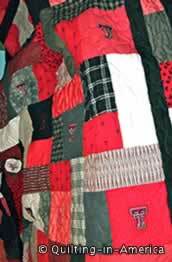 This high school memory quilt includes strips of the student's plaid school uniform skirt. It becomes a portrait of the time and events, a beautiful artistic expression of the quilter, and a special memorial for its owner. While it's a traditional art form, quilting is not a static endeavor. Advances in technology have always been embraced by quilters, from the early days when the sewing machine was introduced to new computerized machines and printing techniques. Photographs and other digital images can be transferred to fabric, either by printing from an inkjet printer or through a manufacturer, such as Spoonflower. Memory quilts made using photos and images are a modern version of an album quilt, taken to a new level of personalization. 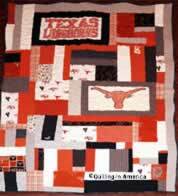 To celebrate a son's departure to college, this quilt was made with icons of Texas Tech University and fabrics featuring the school colors. It will be a special keepsake long after graduation. Memories of special people are imbedded in the things of their lives. A best friend's t-shirts, a husband's dress shirts or suits, a father's neck-ties, a son's flannel shirts or jeans, a mother's dresses or aprons, or any of many other types of textiles may all be sources of materials to create a special quilted memorial. Have A Great Story About a Memory or Signature Quilt? Have you made or received a memory, signature, or friendship quilt? What memories does it preserve? Why is it special? Share it!